With all the media focus on the Touareg—Volkswagen’s high-profile SUV with Porsche DNA—the 2012 Volkswagen Tiguan has largely flown under the radar. If you ask us, this little crossover deserves more attention than it gets. The Tiguan’s got some appealing new features this year, headlined by stylish Audi-like headlamps and revised automatic transmission programming that yields two additional miles per gallon. As ever, its turbocharged inline-four engine and upscale interior set it apart in the crowded compact-crossover segment. Our best guess as to why more people aren't scooping up the Tiguan is that many assume that VWs are more expensive than comparable vehicles from, say, Honda and Toyota. Check the Tiguan’s pricing, though, and you’ll see that it starts under $23,000 with the manual transmission—and that includes a lot of standard equipment. Add the automatic and you’re still safely under $25,000, with an engine that puts the CR-V’s and RAV4’s four-cylinders to shame. The other misconception is that “It’s just a Volkswagen,â€ when the reality is that VW has been making premium-grade products in this country for many years. Indeed, we think the Tiguan makes for an interesting alternative to entry-level luxury crossovers like the Cadillac SRX and Volvo XC60. So don’t be dissuaded by the lack of media fanfare about the Tiguan, and don’t fall prey to that pair of misconceptions. This is one of the best compact crossovers you can buy; make sure it’s on your radar screen when you’re ready to start shopping. The Tiguan’s turbocharged inline-four punches above its weight, delivering ample low-end torque and satisfying acceleration all the way to redline. Fuel economy is quite good for this level of performance. 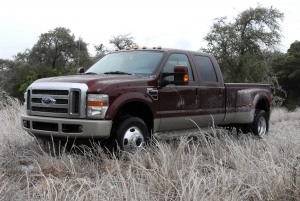 Interior quality is excellent, and there’s ample room for four full-sized adults to cruise in comfort. The highway ride is blissfully smooth and quiet. The automatic transmission is geared too tall at moderate speeds, causing the engine to “lugâ€ noticeably. The headlamps don’t shut off automatically when you leave the car. Cargo space is relatively limited. We weren’t impressed with the stereo’s sound quality, and we’d like the steering wheel to telescope out another inch or two. 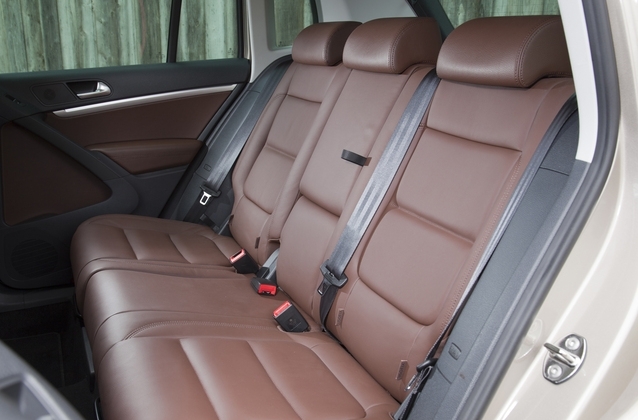 The Tiguan SE’s height-adjustable driver seat makes it easy to dial in a commanding view of the road ahead. At a steady 70 mph, the Tiguan provides Lexus-like isolation from road and wind noise—it’s a real pleasure to drive on the highway. 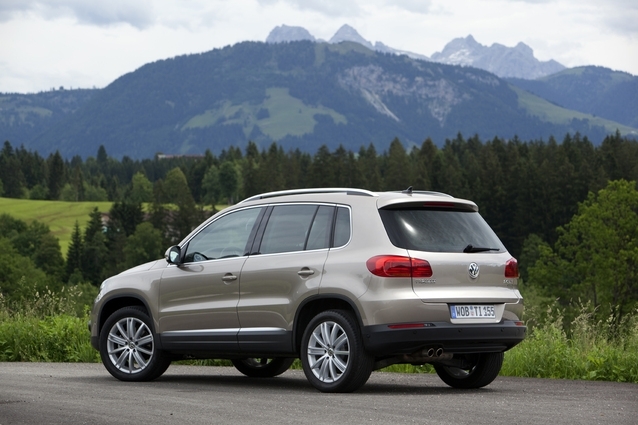 Impacts are sometimes firmly transmitted through the cabin, however, reminding us of the Tiguan’s humble Golf roots. In the corners, the Tiguan isn’t exactly the GTI-on-stilts that some make it out to be, as its soft suspension tuning and slow steering discourage enthusiastic driving. It’s far from a sloppy handler, though; it just doesn’t engage the driver like some other VW products, including the bigger, heavier Touareg. The 2012 Volkswagen Tiguan is powered by a turbocharged 2.0-liter inline-four rated at 200 horsepower and 207 pound-feet of torque. Our front-wheel-drive SE test car (all-wheel drive is optional) had the six-speed automatic transmission. We’re generally infatuated with this drivetrain. Low-end torque is plentiful without compromising high-rpm performance—a rarity among turbocharged engines—and the transmission is luxury-car smooth, yet pleasantly responsive to throttle inputs. But if you’re test-driving an automatic Tiguan, settle into a 40-mph cruise and see if you notice the unusually tall gearing, which pegs the engine at a very low 1,200 rpm and causes unseemly “luggingâ€ vibrations when the throttle’s squeezed. The 2012 Volkswagen Tiguan is EPA-rated at 22 miles per gallon city, 27 mpg highway, and 24 mpg combined with front-wheel drive—two mpg better than last year’s 22-mpg combined rating. 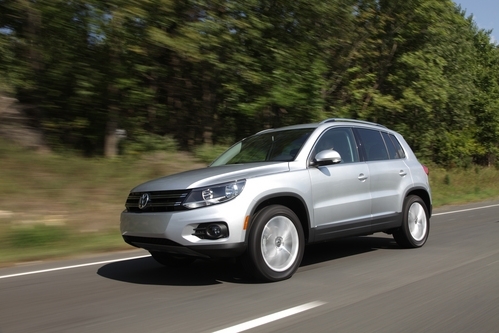 Given the Tiguan’s spirited acceleration, we think 24 mpg is a pretty impressive number. For perspective, the comparatively sluggish Chevrolet Equinox V6 is rated at just 17/24/20 with front-wheel drive. Even the base Tiguan comes with a strong roster of standard equipment, including heated mirrors, cruise control, Bluetooth, and an eight-speaker audio system. The only missing tech feature there is iPod connectivity, which is standard in the next-level LE model. Our SE test car added standard niceties like 18-inch alloy wheels, chrome trim, roof rails, and an upgraded touchscreen audio system. We like the touchscreen, but the speakers didn’t hold up their end of the bargain—we noticed some buzzing and distortion during bass-heavy tracks. Also, we should note that our SE was missing auto-off headlights, an extraordinary omission in a 2012 model at this price point. Our Tiguan additionally had the optional panoramic sunroof/navigation system bundle, which we fully endorse: the navigation interface is straightforward, while the huge sunroof brightens up the interior and features Volkswagen’s rotary sunroof controller. Overall, we certainly enjoyed the SE’s feature set, but given the price premium it commands, we’d advise considering lesser Tiguans and their solid equipment rosters. We’re indifferent about the look of the Tiguan’s dashboard, but its materials are beyond reproach. Even the dash-top storage well is soft to the touch. There’s evidence of cost-cutting in the rear compartment, notably the door panels, which are hard in places where the front panels are supple. 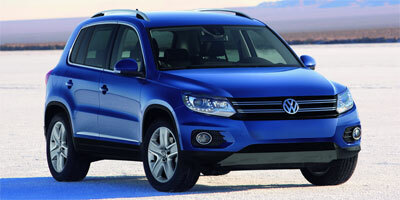 In most respects, though, the Tiguan can go toe-to-toe with compact luxury crossovers in cabin quality. Seat comfort in front is enhanced by lumbar support for both driver and passenger, while rear passengers will have a lovely ride thanks to a high bench, ample headroom, and plenty of legroom. Cargo space, however, is limited by class standards, measuring just 23.8 cubic feet behind the back row and 56.1 cubic feet with the rear seatbacks folded down. The 2012 Tiguan’s new headlights look like they came off a luxury vehicle, but the Tiguan’s overall shape is little changed, and it’s always struck us as awkwardly nose-heavy. There’s a premium vibe to the way the Tiguan presents itself, but we think it’s not as successful as it could be. As we touched on at the outset, the Tiguan is actually fully competitive on price, and arguably bargain-priced if you look at it as a luxury-crossover alternative. Consider that every Tiguan, starting with the sub-$23,000 manual-transmission model, comes with the wonderful 2.0-liter turbo four, while rivals like the Equinox, CR-V, RAV4, and Kia Sorento start with inferior naturally aspirated four-cylinder engines. Our SE test vehicle’s $31,345 sticker is a little harder to defend—you could easily get into a RAV4 V6 or Sorento V6 for that kind of money—but given the Tiguan’s comparatively premium feel, we still say it’s a good buy at that price. The Tiguan deserves so much more love than it gets. What more could you want in a compact crossover? This VW belongs on the test-drive list of every shopper in this segment.